For our Christmas work-do, we went to The Crystal Maze LIVE Experience in Angel, London. We had a fantastic time cracking cryptic puzzles, time-hopping through ancient eras and collecting coveted crystals (we’re like magpies). Before entering the Maze, teams were randomly selected, which was a nerve-wracking process. It felt a bit like a first date, with all the accompanying worries and butterflies. Would we click with our new teammates? Would their strengths complement our weaknesses and vice versa? Would we look cute together wearing the matching Maze jackets? It turns out we didn’t need to worry. Luckily for us, we were grouped with three lovely Americans, one of whom was Amanda Harris. 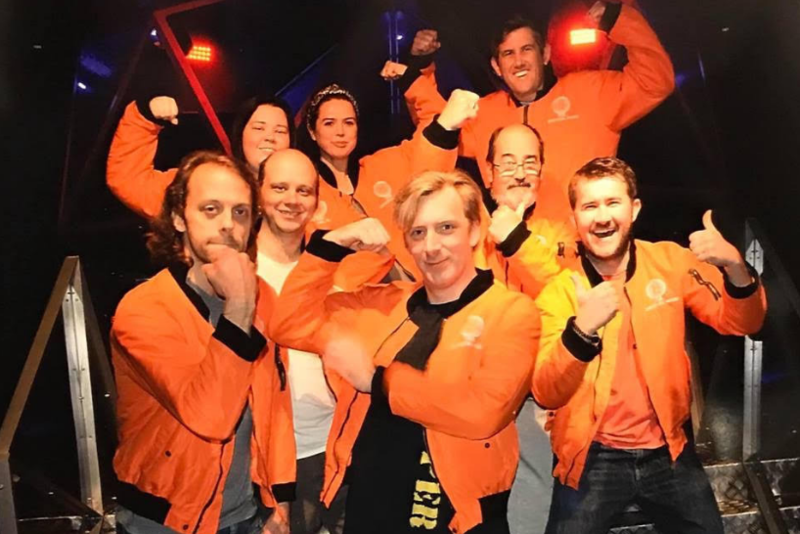 The Gods of Crystal Maze were looking out for us that day because Amanda happens to be an escape room Guinness World Record holder (we couldn’t make it up). 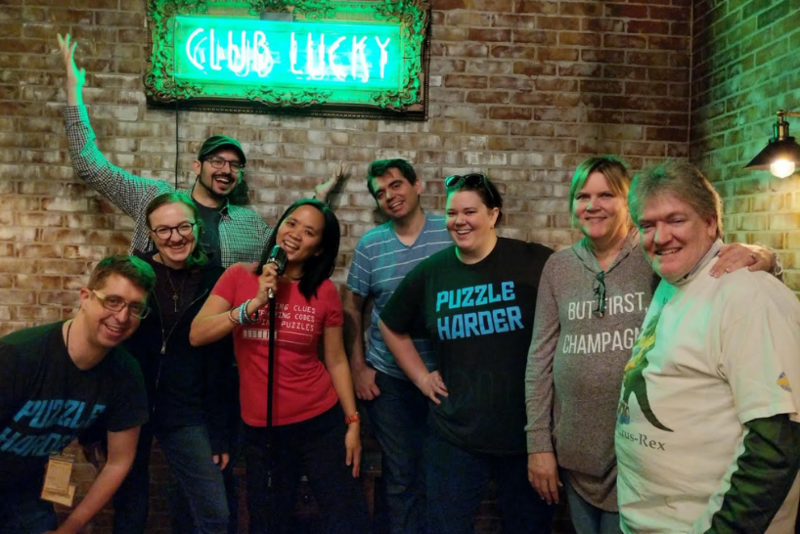 She discovered her passion for puzzles and brainteasers early on – now, she has 966 escape rooms under her belt. 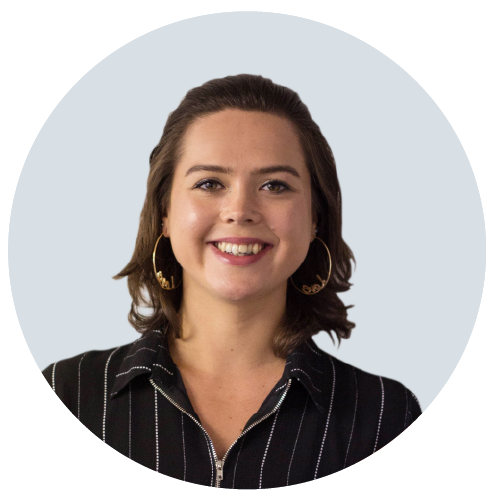 She hails from a small town in North Carolina, on the east coast of the US, and has recently relocated to the San Francisco Bay area. As well as puzzles, she enjoys spontaneous road trips and cat gifs. 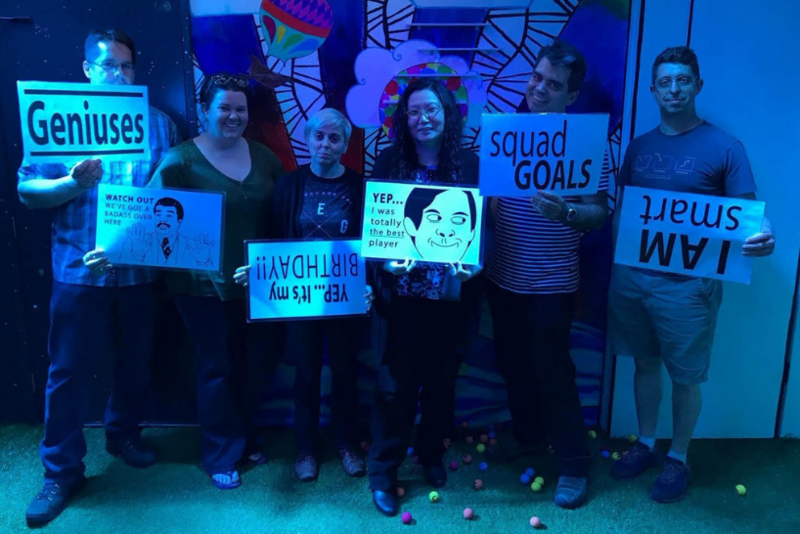 We interviewed Amanda below to talk about her experiences – this is a must-read for all escape room enthusiasts out there. When did you discover your passion for escape rooms? Take us back to the start. In July 2014, my friend Darin and I were planning a girls’ weekend to Chicago. I was clicking around on TripAdvisor looking for cool things to do when I stumbled across “Trapped in a Room with a Zombie”, presented without a lot of context or details. I messaged her to joke that it seemed to be an option to get locked in a room with a zombie on this trip, and she responded with “Well, clearly we’re doing that”, so we booked it! At the time, I didn’t know it was puzzle-related at all, just that it was some adventure-style experience. We didn’t get out but it was so much fun, and I was immediately jonesing to do another one like it. I researched what options there might be near San Francisco, because my boyfriend was out there for work at the time, and it turns out there were a handful of early escape rooms there. Escapes weren’t as readily available in most US cities then. I went to my second room a month later, in August, and from there, I was hooked. In the remainder of 2014, I played several in the San Francisco area and some in Seattle. The first time I escaped was during my 8th room, in October of that year. 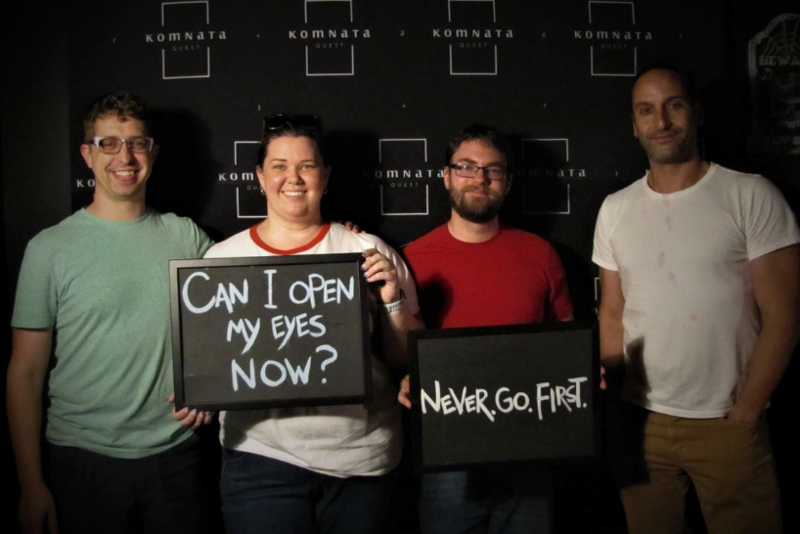 How many escape rooms have you been to and completed? I’ve played 966 rooms to date and escaped 858. Each year, I’ve done more than the last – I think it will be hard to top 2018’s number of 304 though. We’ll see, the year is young! You hold some pretty impressive records – can you tell us more about that? I was part of a team of four that completed 22 rooms in 24 hours in Moscow for the Guinness Book of World Records. It was such an intense day of puzzles – we played for 24 hours straight! What’s the best and worst escape room you’ve done and why? That’s a tough question. Some escapes are super immersive and active, where you feel like you’re literally on a movie set, but others are focused on puzzles and riddles, which I also love. I have a handful of top contenders for each, depending on what style of room we’re talking about. But I think my overall favourite room of all time is the Edison Room at Palace Games in San Francisco. I won’t be mean and list the worst rooms by name. At least terrible rooms sometimes make good stories. I played one that was so infuriatingly frustrating, misleading and broken that I rage-solved a 300-some character cryptogram without even finding the letter substitutions. I just solved it newspaper-puzzle style using letter distribution trial and error, so that we could extract the final door code and storm out. There’ve been games where the GM was unresponsive for long periods or where puzzles were so broken we left before finishing or before our hour was up. Those are just kind of sad, instead of intriguingly bad! I like to joke that I’m at the point in my escape career where seeking out the worst rooms in an area is its own kind of fun. In your opinion, what makes a successful escape room? What elements does it need? It’s hard to construct “aha” moments, but flashes of surprise and delight and unexpected reveals are signs of success for me. I also think a good learning curve is important. The room should make sense while being complex – the early interactions should give you a feel for how later puzzles work. For example, you need to have an understanding of whether a word lock resolves to a word or just to a series of letters. I’d like to see fewer written signs, instructions and run-books. I want more in-game audio, visual feedback and gating or signposting baked into the design. I have definitely had phases of infatuation, as an enthusiast. For a bit, I was obsessed with smooth tech and magic effects. Then, I was big on set and scenery. Later on, I was fascinated by size, scale and use of space. Now, I’m into little tweaks that make a puzzle unique by putting twists on a classic! I’ve done enough prisons and asylums to last a lifetime, so I’m always happy to do something that ties into local history, or that’s a bit whimsical and silly. We met at the Crystal Maze experience in London. How did you hear about it? Is Crystal Maze popular in the U.S? I’ve heard from many enthusiast friends that Crystal Maze was a must-do, and it did not disappoint! I don’t have the cultural background of it as a TV show from my youth, but we had some similar style shows, like Legends of the Hidden Temple. You guys were great teammates, too, which helps any public booking! You’ve travelled quite a bit for escape rooms – how do you research where to go? Are there forums or websites highlighting must-visit places? A lot of my wish-list is based on other enthusiasts visiting a city and raving about it, so word of mouth. There’s lots of escape tourism talk in the enthusiast Facebook groups and on the escape enthusiast Slack channel. There are also some very well written blogs – RoomEscapeArtist.com is my favourite US source. Usually, I compile a list of recommendations along with any intriguing themes or unique mechanics that stand out to me, then I map them and start tackling the logistics and planning schedule. How did Crystal Maze compare to other venues? I was afraid that Crystal Maze might be a more physical challenge and less puzzle based, but it struck a great balance! The staff did a great job of injecting some energy and humour, and the set was very impressive. 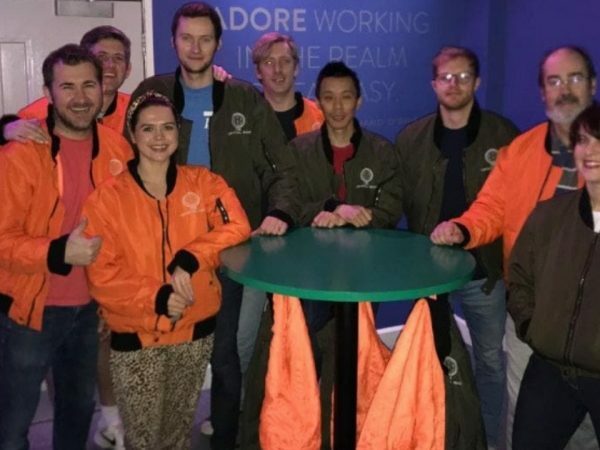 I’ve only seen a few experiences where one person gets singled out to do a task each time – Crystal Maze still managed to make it feel like teamwork in the end. 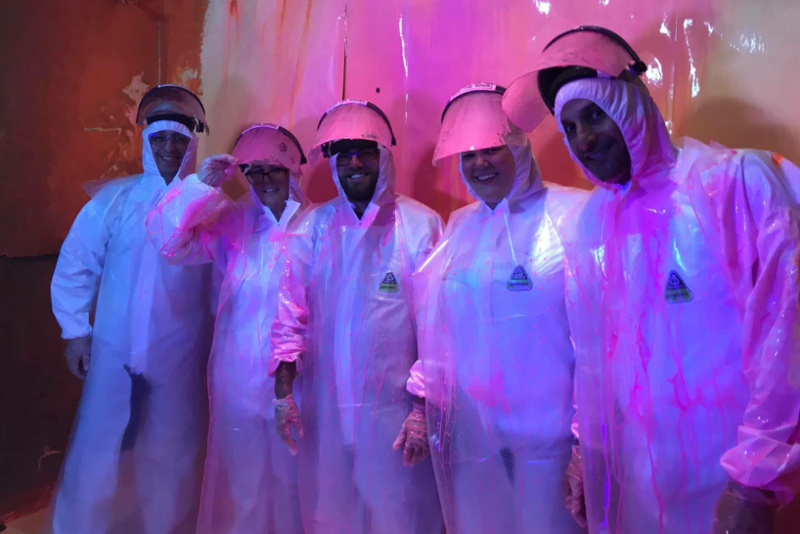 How can escape rooms provide a better experience for their visitors? The customer experience stretches from pre-booking to after the event, so a company’s website should be easy-to-find and easy-to-use. Having a welcoming lobby that encourages group outings is a plus. Just having a great room isn’t really enough to capture the general public’s entertainment-related budget. How important is the pre and post experience? In your opinion, how could venues improve this? Positive pre and post-game energy from the GM can really help successfully book-end the experience. You want to feel like you have something fun to look forward to when you arrive, not that you’re about to be checked in for a dental procedure. Hopefully, there’s a GM outside of your room when you finish, win or lose. Sometimes rooms will have an in-game win reveal or loss reveal, but others will only have a cool effect for if you lose. If you win one of those, you just kind of stumble blearily back into the hallway where you started. It’s kind of abrupt! I’m looking forward to travelling more this year to do escapes. I’ll be at Up The Game in the Netherlands, and I hope to pad some escape tourism on the front or back of that trip. I don’t know yet what I’ll do for room #1000! If you liked this blog, check out our full Crystal Maze LIVE review.